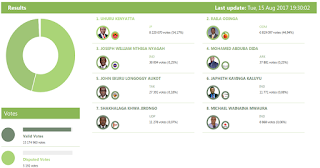 IEBC Provisional Presidential results streaming 7 days after Elections on the IEBC portal. - Bana Kenya News, Real African Network Tubanane. Home featured IEBC Provisional Presidential results streaming 7 days after Elections on the IEBC portal. 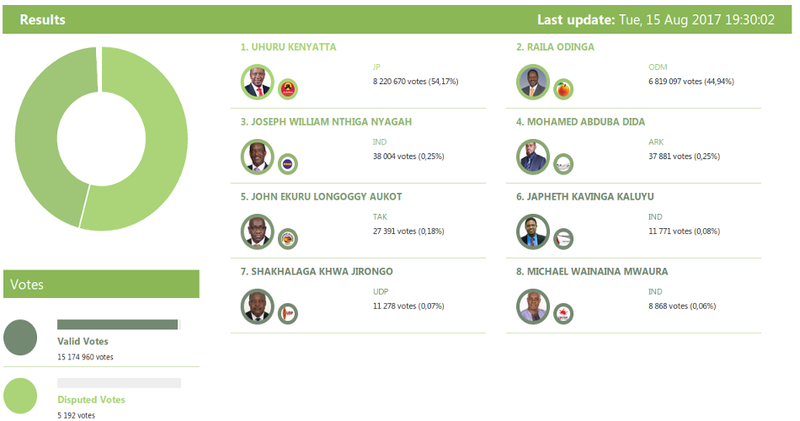 IEBC Provisional Presidential results streaming 7 days after Elections on the IEBC portal. The IEBc results were still streaming three days after the IEBC chairman Wafula Chebukati announced the Presidential Candidate winner. The incumbent President Uhuru Kenyatta emerged the winner and was announced on Friday after the commission validated the forms 34B. The 7 days provisional streaming clearly showed that the process had some problems. On Monday, the Presidential provisional results for Uhuru Kenyatta went up to 9.2 Million votes and Raila Odinga trailed at 6.80 Million. On Tuesday the results declined to 8 220 670 votes (54,17%) from (9.2 Million) for Uhuru Kenyatta and 6 819 097 votes (44,94%) up from 6.80 Million votes. Kenyans have been asking if the results streaming were really authentic as the elections completed on 8th August, Winner announced on 11th August and on the 15th August the results were still streaming in.